Arlo & Janis set the mood as I celebrate nine years of cartoon blogging with a collection of strips that predate CSotD, only a few of which I’ve slipped in over the years. Arlo isn’t so much morbid as realistic with a tendency to brood, and there are any number of strips I might have chosen in the same mood. And speaking of strips that spark a sigh, my friend and oft-times collaborator Christopher Baldwin, before he started the Spacetrawler series, ran a comic for years that was basically the diary of a fictional young woman named Bruno. This one got snagged and saved because I think I wrote that novel. 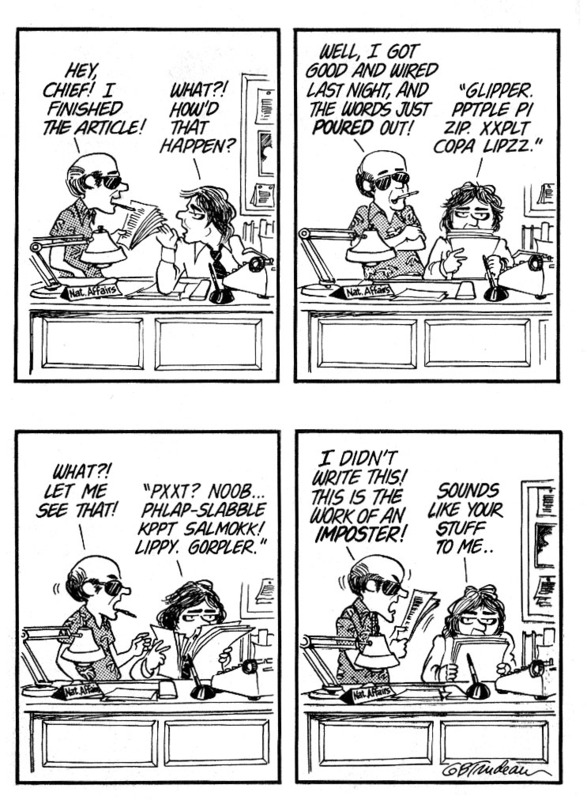 I know I’ve posted this Doonesbury in the past, but it’s a keystone of my writing career for very practical reasons. I used to work on into the night, but kept a mechanical alarm clock in my basement office, which didn’t go off at 12:30 but made a loud click at that hour, enough to remind me to wrap it up and go to bed. Anything written any later than that was going to be crap. 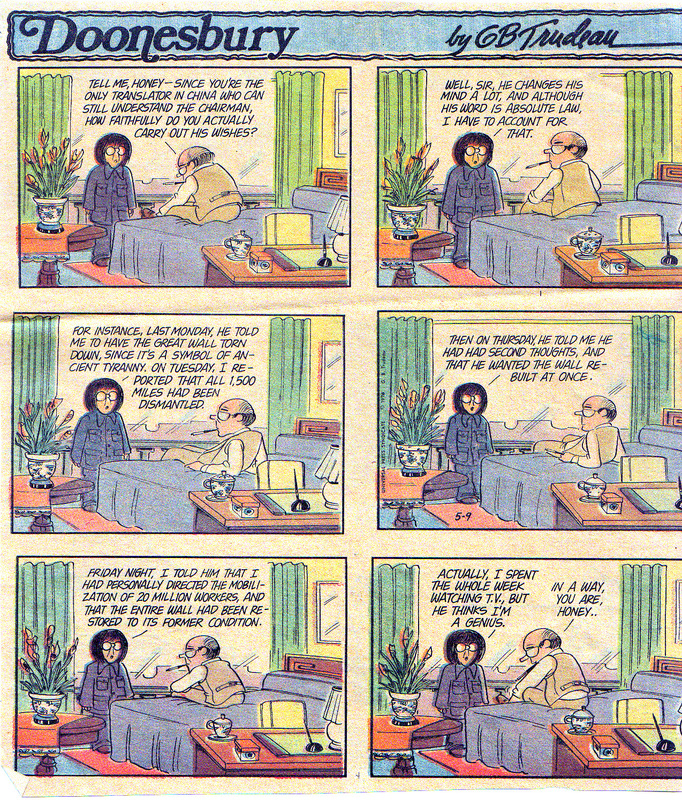 And here’s another old Doonesbury, to which I add a new story, which is that I thought this 1976 strip was astonishingly appropriate to our current administration, but wished I had a clearer copy, this being scanned from the original newsprint copy that was on my office wall for years, next to the above strip. I discovered that (A) other people have also made that connection, (B) the “real” online version at GoComics is awfully lo-res and (C) thus it’s my scan that has become the default version all around the Intertubes. Well, I hope it sells you a few books and wins you some new fans, Garry. For further commentary, see yesterday’s discussion of how Trump’s staff indulges his lack of focus. This 2002 editorial cartoon is not cynical. Capitalizing on our national grief is cynical, and not only were we flooded in war-profiteer shirts and bumper stickers back then, but the circulation directors in my paper’s chain — and I’m sure others — got a letter from Corporate demanding to know how we planned to replicate our single-copy sales from Sept 12, 2001 a year later. That’s cynical, even before our national grief was weaponized to justify a disastrous and irrelevant war (Powell’s UN speech was not until Feb 2003). This cartoon asks how anyone could be so cynical as to take such a special moment and turn it into a profit center, and it began my ongoing correspondence with Ann Telnaes, because I emailed her and asked if any papers had picked it up. She replied that she didn’t know, she doubted it and she didn’t care. Which is how friendships are built. “Cynical” is creating sentimental glurge and chest-thumping jingoism that you don’t believe in but that you know editors will purchase. I like this kind of cartoon better. 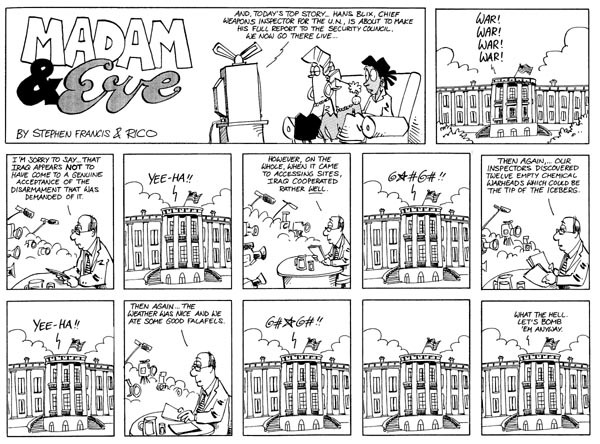 Also on the topic of the greatest blunder in American history, I think we’d be better off if we sometimes paused to consider that “the whole world is watching,” including South Africa’s Madam and Eve, and trimmed our sails accordingly. Then again, we don’t listen to each other, so why would we listen to them? This David Horsey 2001 piece hasn’t lost its relevance, and if you think we’re going to make the right moves over the next 12 years, you’d better find a reason we didn’t over the last 18, and fix it. DD Degg reports that Boondocks may be coming back. If that happens, he can run this 2006 one again just by changing a few names here and there. 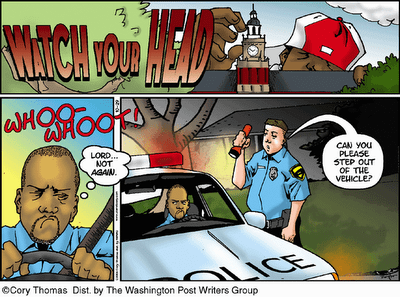 And a final political piece, because this becoming depressing, but here’s a Watch Your Head, also from 2006, that I’ve used often because it’s been relevant often and it remains relevant too often, even though the strip has ended long since. Which is another story: Why would a newspaper want to run a strip about college students when it already has a strip about a policeman who’s married to a nurse? Another excellent strip that couldn’t make it past some fools was Cleats, which finally folded, though it’s still in reruns at GoComics. The problem appears to have been that, while sports editors should know that a huge percentage of their readership is involved in youth sports, they themselves are more geared to dreaming about the pros. Cleats was tailor-made to appeal to and attract new, younger readers. No, really. Don’t get me started. Well, if newspaper people don’t understand marketing, others in media are capable of figuring out audience demographics, as Frazz and Caulfield discussed. Since I cut the cable and went to Smart TVs, I’ve been watching CNN and MSNBC while I fix dinner and those talk radio advertisers are also buying TV time and have picked up on our nation’s greatest need, which is to get rid of stubborn belly fat, and to replace the fat between your ears with something originally discovered in jellyfish. And, by the way, as this Loose Parts from 2009 suggests, if you think those smiling bastards on the television are your friends, boy jayzus you’re mistaken. Tom the Dancing Bug appears to have been spying on me as I cooked. And while Ruben Bolling was peeking in my windows in 2000, Hilary Price was scouting my neighborhood that same year, because I’ll swear this neighbor lived just around the corner. I’ll bet the people who lived on that quiet side street were thrilled to have it turned into a gawker’s thruway each December. I prefer less flamboyant bad taste myself, like when I lived in Denver and had neighbors whose creche involved Joseph, Mary, Baby Jesus and Frosty, or the ones on a nearby street whose creche was populated entirely by flamingos with washcloths on their heads. Okay, I genuinely did like that last one. The story goes that legendary New Yorker Editor Harold Ross didn’t get it and was appalled when, after it had appeared in his magazine, he figured out the gag. 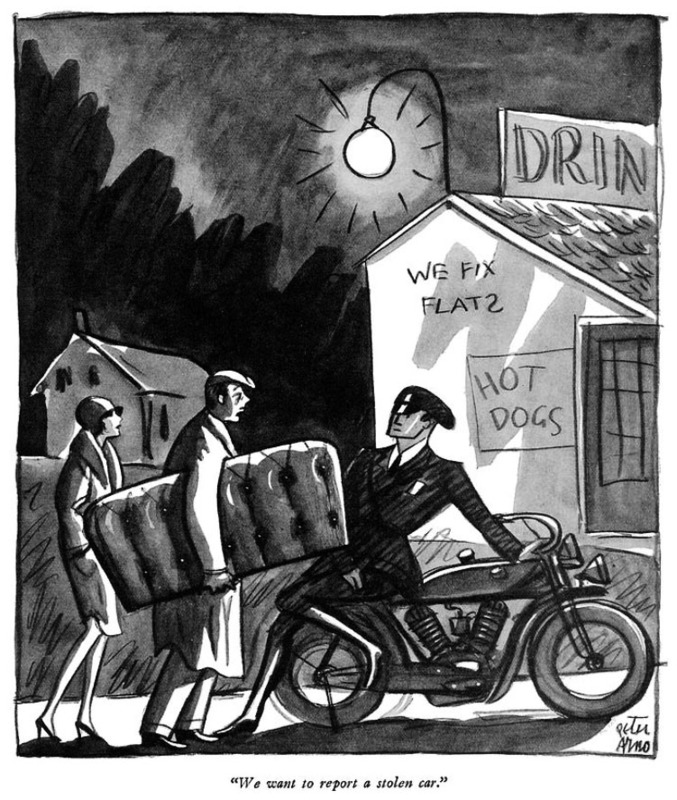 Others say that it is unthinkable that he wouldn’t run every Peter Arno cartoon through a dirty joke filter, but I’m inclined to side with Arno and Thurber, mostly because, as I’ve often observed, most editors have no sense of humor. I am assured that this Pardon My Planet is entirely innocent and simply reflects the way people dressed in 2004. Of course, I could be wrong, since I generally identify with Geech. I know I’ve posted this Calvin and Hobbes before, but it’s close to my heart because it sat over my desk during one of my darker periods, when, as just mentioned the other day, I was trying to find a new job while my current employer was pressuring me to quit the one I had. Though, as seen in this Non Sequitur, you have to realize that management has good reasons for the decisions they make. I used to tell my boss that HQ should peg our circulation goals to the price of company stock: If we are required to jump it up five percent, it would only be fair that they should do the same. He agreed. He got fired less than a year after I quit and we were both considerably happier. By 2009, when this Fastrack appeared, I’d semi-retired and could look at it with a shake of the head, remembering those days. It’s a whole lot funnier once you’ve broken through to the other side. This early Pearls is more cynical on the overall topic. The strip was, in 2003, less than a year and a half old, so I don’t know if Pastis had been able to stop being a lawyer yet, but it certainly suggests that he’d contemplated the futility of it all. Which is how humor is born, after all. Thanks to you all for sticking with me all this time, and I’ll see you again tomorrow. Happy birthday to the blog, Mike. Long may it wave. No photographs of the flamingos? I came across your blog several years ago through Michael DeAdders page on Facebook. He’s not the kind of guy that brags a lot but he sure was pleased when he made your blog. Please keep up the good work, I never miss a day. Wishing you many more bloggey birthdays. PS. Thanks for keeping the music of Phil Ochs alive. Congrats. Love this site. It’s a daily read every day. Happy Anniversary, Mike. This blog gives me great joy. Happy Blogiversary! Can never get enough toons and your blog is the best. Only nine years? Seems I been reading you for twice that long. Way to go. Keep fighting the good fight, you got a ways to go. And a lot of us who didn’t care much for W have now seen him gain in our estimation by comparison. Much appreciation for your work over the years. Best wishes, good dogs and bonhomie for the years to come. As many have already observed, you are one of the many sites I rely on every day to see that there is actually someone else who comes at things a lot the way I do. I’m not sure if that’s a good thing but keep doing what you’re doing, K? It’s great. Even the politics rings true up here in Uhmuricuh’s attic. It’s a daily “”must check” for me – your insight, sense of humor, and links to a wide variety of information make me kind of glad you weren’t successful at becoming the next great American novelist, as it’s likely I wouldn’t have discovered you. Thanks for your daily efforts; they are very much appreciated. Happy anniversary, Mike. Keep up the good work. And, among many other things, thanks for introducing me to “Wallace the Brave.” It might (may? . . .? ) be my favorite comic strip ever. I love its mix of quirkiness and warmth. I started reading this a few years ago, when it was recommended in the venerable r.a.c-s group, and have read it daily ever since. Live long and prosper. You do good work. Is it just me, or does Honey look like Linda Hunt from “NCIS: Los Angeles”? 26 queries in 0.317 seconds.